See Board of Regents Policy Manual Section 2.5. Develop programs and policies that support the initial and subsequent requests for institutional accreditation from Southern Association of Colleges and Schools Commission on Colleges (SACSCOC). Develop programs and policies that support the requests for professional certification of teaching and nursing programs and other certifications/accreditations as needed. Continuously refine the general education curriculum at GGC. 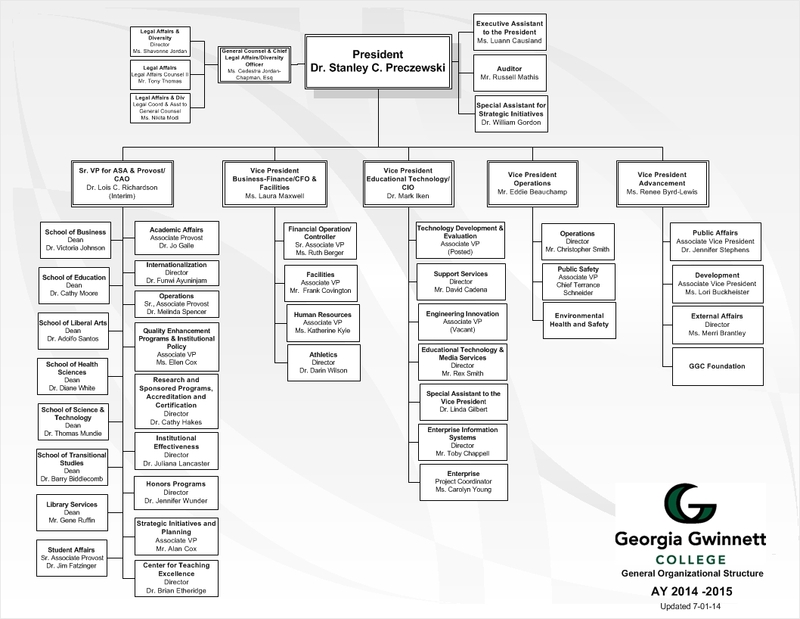 Continue the development of the academic programs at GGC. Continuously refine required learning development programs. Develop accredited programs of instruction in all subject areas approved by the Board of Regents. Review and update the institutional master and strategic plans as required. Develop and update a comprehensive plan for facilities, infrastructure, and land use. Maintain a comprehensive resource plan that will support the needs of GGC using both public and private money as well as tuition, fees, and auxiliary revenues. Develop and submit to the Chancellor operational budgets for each fiscal year. Engage the Georgia Gwinnett College Foundation as a means to acquire private and corporate resources to support the students, faculty, and programs at GGC. Monitor and work to achieve initial fund raising goals for the GGC Foundation. 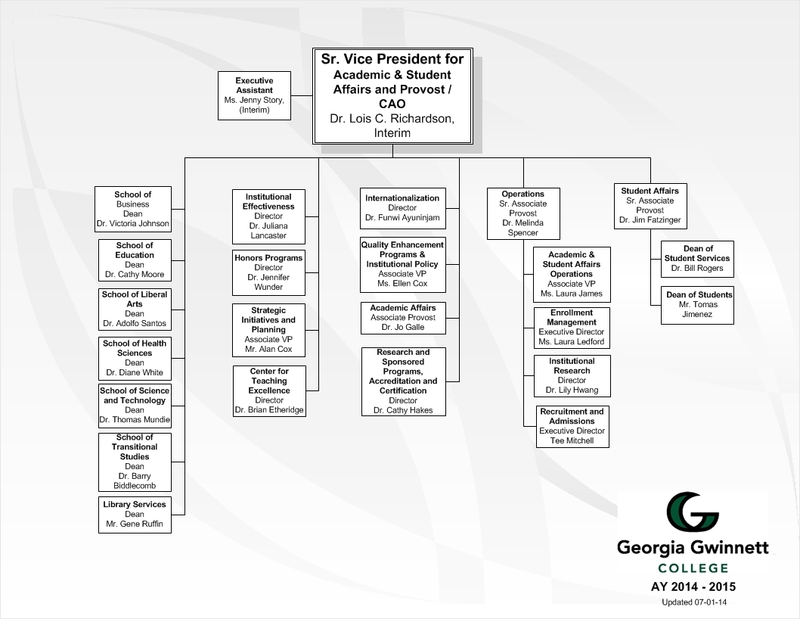 Serve as the Vice Chair of the Georgia Gwinnett College Foundation. Determine and articulate to the Chancellor the immediate and ongoing facilities needs of the institution. Prepare and submit to the Chancellor comprehensive facilities plans addressing anticipated needs. Explore opportunities for public-private ventures in order to construct facilities for which appropriated dollars will not be available. Maintain administrative and financial control over intercollegiate athletics policies and procedures, operating budgets, recruiting standards, and academic standards for athletes. The President shall be the ex-officio chair of the faculty and may preside at meetings of the faculty. The President or the President’s designee shall chair the faculty senate and preside at its meetings. The President shall be the official medium of communication between the faculty and the Chancellor and between the faculty senate and the Chancellor. The President shall appoint faculty members and administrative employees of the college, approve the salary of each, approve all promotions and shall authorize all reappointments of faculty members and administrative employees, except as otherwise specified by the Board of Regents. The President has the right and authority to grant leaves of absence to members of the faculty for study at other institutions or for such reasons as the President may deem proper. The President is authorized to accept on behalf of the Board the resignation of any employee of Georgia Gwinnett College. Settlements of grievances and complaints (including those filed by state and federal agencies) that do not include a monetary commitment of more than $100,000. Agreements shall be subject to review and approval by the Georgia Department of Law Notice of settlements shall be filed with the University System Office of Legal Affairs. The President of GGC is authorized by the Board of Regents to take or cause to be taken any and all such other and further action as in the judgment of the President may be necessary, proper, or convenient in order to carry out the intent of established Board of Regents policies. Additionally, the Vice President for Advancement is responsible for administering, implementing, enforcing, and evaluating policies relevant to the duties described. Student Success Programs across the spectrum from admission to graduation, including programs such as the first year experience, new student orientation, academic mentoring, advising, learning assistance, testing, learning communities, and honors. Academic budgeting/forecasting. 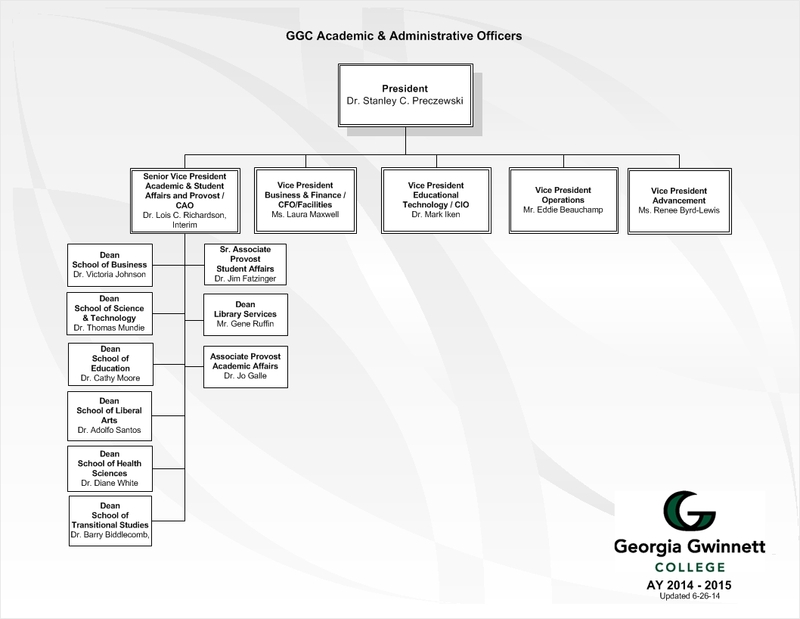 As the chief academic officer of the college, the SVPA&SA/Provost articulates and directs the academic vision of the college and provides academic and administrative leadership to establish and enhance Georgia Gwinnett College’s commitment to academic excellence that serves the needs of the community. The SVPA&SA/Provost advises the President on strategic planning and institutional policy and operations, and acts on the President’s behalf in his absence. The Center for Teaching Excellence, faculty professional development. The SVPA&SA/Provost is also responsible for providing leadership, management and administrative direction to the student affairs/services area. The SVPA&SA/Provost is responsible for all areas of student development, student life, and student involvement, as well as career services and the counseling of students. Additionally, the SVPA&SA/Provost is responsible for administering, implementing, enforcing, and evaluating policies relevant to the duties described. The SVPA&SA/Provost serves as the president in his absence. 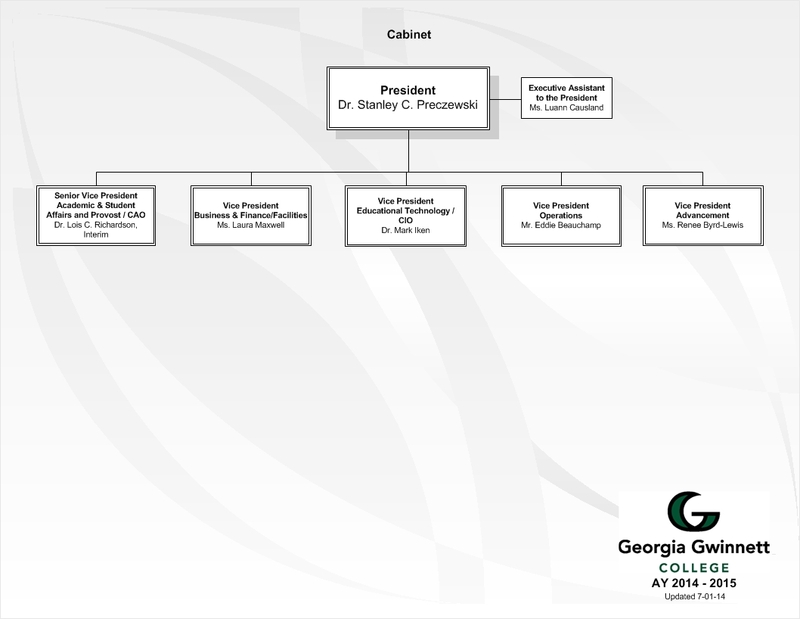 The Vice President for Business and Finance/CFO and Facilities reports directly to the President, serves on the President’s Cabinet, and is the chief business officer for Georgia Gwinnett College. The Vice President plays a key role in shaping the strategic direction of GGC through efficient and innovative resource management, planning, and problem-solving. The Vice President provides leadership for and oversight of budget, accounting and financial operations, student accounts, human resources, facilities management and maintenance, construction, auxiliary services, and logistical services. The Vice President for Operations reports directly to the President and serves on the President’s Cabinet. The Vice President plays a key role in shaping the strategic direction of GGC through efficient and innovative space utilization, scheduling, environmental health and safety, public safety, fleet operations, and special events. The Vice President for Educational Technology/CIO reports to the President and serves on the President’s cabinet. This position directs the operations of centralized computing services and support, networking, telecommunications and cable TV infrastructure, desktop computing, academic/classroom/online technology, printing, and campus digital communications and collaboration services. The Vice President also provides management and leadership for the technology and communications enterprises of the College in collaboration with College stakeholders. The Vice President plays a major role in the formulation and implementation of programs essential to the innovative mission of the institution. Other responsibilities include providing institutional leadership in strategic planning, oversight, budgeting, and policy direction for the Office of Educational Technology, representing the institution to the University System of Georgia, committees and task forces on information technology, and integrating innovative solutions in all facets of the College concerning infrastructure support of teaching methodology. Additionally, the Vice President for Educational Technology is responsible for administering, implementing, enforcing, and evaluating policies relevant to the duties described. The Vice President for Advancement (VPA) reports directly to the President in a key leadership position that is consistent with the mission and goals of the college. A member of the President’s Cabinet, the VPA works closely with senior academic leaders and administrators to provide guidance and strong judgment on the full range of issues, challenges and opportunities facing the college. From an operational perspective, the VPA provides leadership and oversight of the Offices of External Affairs, Public Affairs and Development. 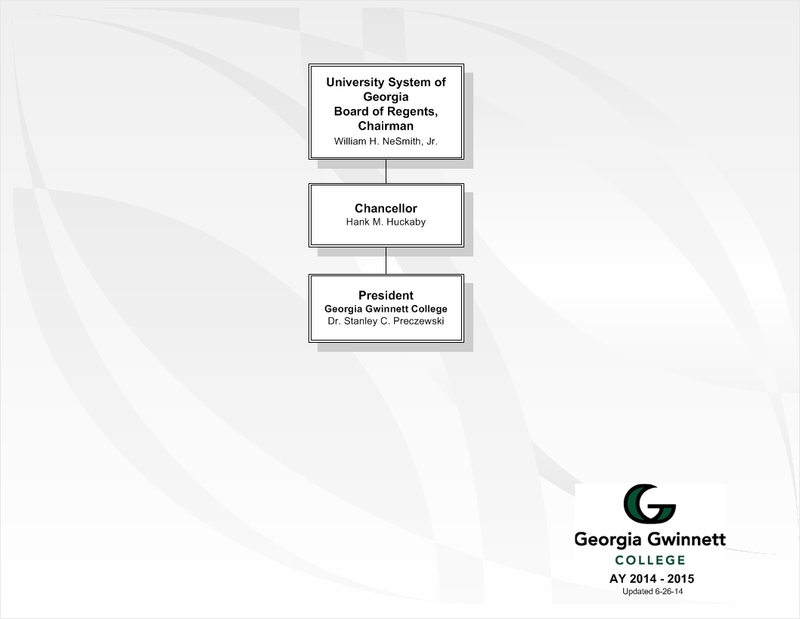 Key external affairs responsibilities include building a solid network of relationships with elected and appointed officials at local, state and national levels, the Board of Regents of the University System of Georgia as well as business and civic leaders and citizens. From a Public Affairs perspective, the VPA is responsible for ensuring a comprehensive strategic public relations program including marketing, brand identity, media and public relations and communications efforts. Finally, the Office of Development is tasked with building a solid network of financial support through strengthening relationships between Georgia Gwinnett College and its key constituencies. Key program components include major and planned gifts, corporate and foundation grants and fundraising events. The Vice President of Advancement also serves as the President of GGC Foundation, an independent 501(c)(3) non-profit corporation, whose purpose is to support the College’s mission for student success and innovation in teaching through scholarships, research grants, training and campus improvements. • In the event of an imminent campus emergency where the President cannot be reached for consultation and a threat to life issue is involved. If there is ever a situation where the President and all of the above cabinet members are incapacitated simultaneously, the most senior dean shall assume authority until the President or one of the named cabinet members can assume authority or until the Chancellor’s Office can make an interim appointment. See Board of Regents Policy Manual Section 2.9. As one of its fundamental operating principles, Georgia Gwinnett College is committed to operating in the context of sound planning, continuous review, assessment, change, and experimentation. The College’s Strategic Plan is developed through a comprehensive, campus-wide process and articulates strategic priorities and action plans for multiple levels of the institution. Working from the College Vision, Mission and Strategic Plan, each academic program, co-curricular program and administrative office articulates and assesses an appropriate set of program and/or student learning outcomes. Assessment results are used to inform decisions and resource allocation at all levels of the institution, leading to a pattern of ongoing institutional improvement. GGC’s Strategic Plan is developed through a process that includes a careful and thorough external environmental scan to identify external factors that are relevant to the College, a review of the USG vision, mission, and strategic priorities, and a comprehensive internal environmental scan that includes factual analysis and qualitative data generation from all constituent groups. The resulting strategic priorities are shared broadly with the campus community. Specific development of action plans and measurable metrics to implement the Strategic Plan are developed by cross-functional groups at the College and Division level. An annual review of the vision, mission and strategic plan of the institution that is based in assessment data and impacts budgetary decisions at all levels of the College. All Institutional Effectiveness activity at GGC is designed to inform the College about its efforts to achieve its mission and vision. While the bulk of assessment, analysis, and response takes place in individual programs and offices, it is important to consider effectiveness from an institution-wide perspective as well. Accordingly, the College has established goals and student learning outcomes for the college as a whole. These are the Institutional Goals and Integrated Educational Experience Student Learning Outcomes and can be found in multiple documents. As program level student learning outcomes are developed, their relationships to the College’s Integrated Educational Experience (IEE) student learning outcomes are defined. Thus, when each program completes its own assessments, it is possible to aggregate the performance of multiple units in relation to each individual IEE outcome. This provides an opportunity for a more global assessment of how effective Georgia Gwinnett College, as a whole, is in providing appropriate instruction, support, and opportunity for students to develop the expected levels of knowledge and skill. As administrative program outcomes are developed, their relationships to the College’s Institutional Goals (IG) are defined. Thus, when each program completes its own assessments, it is possible to aggregate the performance of multiple units in relation to each individual IG outcome. This provides an opportunity for a more global assessment of how effective Georgia Gwinnett College, as a whole, is in implementing and achieving its mission and goals. The process and structures guiding this effort are described in APM 2.9.1 Institutional Planning and Effectiveness: Assessment Processes, below. The Office of Institutional Effectiveness prepares an institutional aggregate report each year based on the relationships between individual unit outcomes and the broader institutional goals. The College’s initial budget proposal and final resource allocations for each fiscal year are prepared based on the annual review of the Strategic Plan and consideration of significant assessment-related needs. An aggregate report of funding requests associated with assessment findings is provided to the Vice President for Business and Finance annually. This ensures that assessment-related needs are identified and available for discussion as decisions are made regarding fiscal issues throughout the year. Individual units include the estimated cost of their plans for program improvement in their assessment reports. This allows the budget managers of those units to make more effective decisions regarding the operational dollars available to the unit.